If you’ve seen a 3D mouse, or heard about them, but don’t quite know what they are and why you should be using one – look no further! Here, we’ll discuss what benefits there are in using one, as well as let you know the answer to common questions like whether it will work in SketchUp or Vectorworks. We will then explain a little bit about which ones are available, like the CadMouse and SpaceMouse Wireless and SpaceMouse Pro. A 3D mouse is a pointing and control device, just like your traditional mouse, but is specialised for movement in virtual 3D space. A 3D mouse will feature a variety of ways to control models in a 3D environment including multi-axis sensors, accelerometers and even IR sensors. 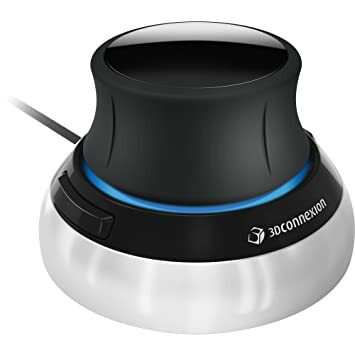 3DConnexion devices are very popular in professional sectors like architecture, CAD, 3D design and 3D modeling because they feature a rotating cylinder on a base that can be raised and lowered, as well as rotated. This facilitates very intuitive environmental movement and model manipulation that gives the user the feeling of holding the 3D object in their hand. Many designers, engineers and 3D professionals prefer to use a 3D mouse in their work for the simple fact that they increase both productivity and comfort. The ability to manipulate, translate, rotate and scale all at the same time is the best way to interact with a 3D part – which is just not possible with traditional mouse and keyboard. Using a 3D mouse opens up a “two-handed” approach as well. With your traditional mouse in one hand, and your 3D mouse in the other, you’re able to spread the workload. This not only increases productivity, but over long periods of time spent modeling, using a 3D mouse can greatly reduce the risk or symptoms of RSI. There can be a short period of time where you’ll need to get used to using a 3D mouse, but it should only take a matter of minutes. Once you’re used to the movements, and have mapped any buttons to the commands you frequently use, you’ll see the benefits straight away. Ultimately, you will feel like you are holding the 3D content in your hand, while decreasing the strain on your usual mouse-hand which leaves you free to be creative. Which Software Packages are Compatible? 3DConnexion devices support a huge range of software packages. To name a few, SketchUp Pro, Rhino, KeyShot, Vectorworks, formZ, Artlantis, solidThinking Evolve and solidThinking Inspire are all supported. 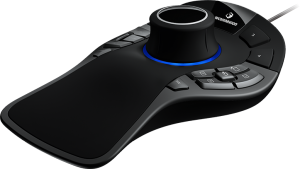 Which Are the Best 3D Input Devices? It depends what you’re looking for when deciding which 3D mouse is best for you. If you’re looking for a cost effective and more traditional mouse, the CadMouse will serve you well. Featuring a high precision laser with 8.200 dpi and CAD specific features, CadMouse and CadMouse Wireless give a comfortable an efficient workflow. For true, intuitive 3D manipulation, the SpaceMouse Compact wired or wireless would be the way to go. 3D navigation that cannot be experienced using a standard mouse and keyboard makes this the idea tool for engineers, architects and designers. Push, pull, twist or tilt to pan, zoom and rotate your 3D models. If you want everything a 3D mouse has to offer – the highest level of performance – look no further than the SpaceMouse Enterprise (pictured below). 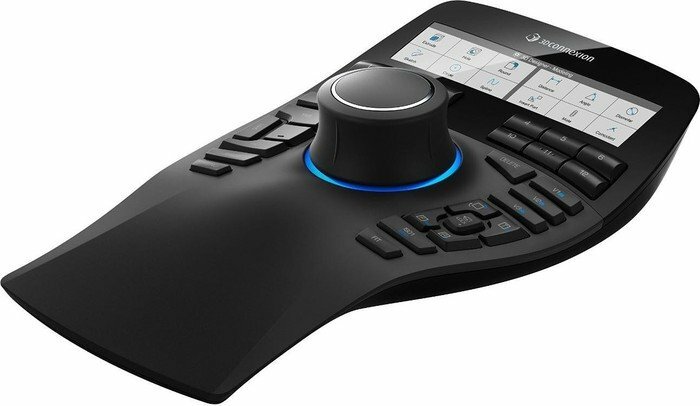 In addition to full 3D manipulation , you have 12 intelligent function keys, colour LCDs for key assignment, quick-view keys, keyboard modifiers and an ergonomic full-size soft-coated hand rest. Interested in a 3D CAD Mouse? A variety of 3D CAD input devices are available now at CAD Software Direct typically on next working day delivery in the UK!